We’d love your help. Let us know what’s wrong with this preview of Zombocalypse Now by Matt Youngmark. To ask other readers questions about Zombocalypse Now, please sign up. WOW. Okay, this was a LOT of fun. Even beyond the novelty and whimsy of reading a choose-your-own-something book in the first place, this one is done *extremely* well. Reading through to each new ending is entirely entertaining, as the writing keeps a constant sense of humor that's both funny and inventive. However, it's when you really start to have read through most of the branches that an unexpected Easter Egg emerges, as your discoveries down different roads illuminate your newest path, whet WOW. Okay, this was a LOT of fun. Even beyond the novelty and whimsy of reading a choose-your-own-something book in the first place, this one is done *extremely* well. Reading through to each new ending is entirely entertaining, as the writing keeps a constant sense of humor that's both funny and inventive. However, it's when you really start to have read through most of the branches that an unexpected Easter Egg emerges, as your discoveries down different roads illuminate your newest path, whether it's having a previous main supporting character crop up in only a passing cameo, or having something occur that would have just seemed like random apocalyptic oddness if you hadn't learned more about the backplot through a markedly different path before. The sum of all these mutually-exclusive choices adding up to a larger understanding of the story in aggregate is something rarely used in these kinds of gamebooks - as a lifelong fan of the medium, I can't recall another instance offhand - and it made the end product far, far more innovative and satisfying than it really had any right to be. Above and beyond all expectations; pick this one up! I loved the choose your own adventures books as a kid so when I read about this book on some Geek site a while back, I HAD to do it. It was awesome!! You're a snarky, chain smoking chainsaw wielding stuffed pink bunny. You're in the middle of a Zombie-apocalypse, living in a world where stuffed animals walk, talk, and intermarry with the human population. There's even a moment where you let out the battle cry "Leeeeeeroy Jenkins!" I was killed by ponies, deer, and a pack of Catholics. I teamed wit I loved the choose your own adventures books as a kid so when I read about this book on some Geek site a while back, I HAD to do it. This is a "choose your own adventure type book for adults" where you are a pink stuffed bunny trying to survive during a zombie apocalypse. I found this book to be a fun, easy, and very quick read. I wish that it had more depth/detail for it to be targeted to adults, but I suppose a choose your own adventure type book is suppose to be simplistic. The first time reading it I was a little disappointed because it was so fast and the ending was so abrupt (and I died), but I found the more times I rea This is a "choose your own adventure type book for adults" where you are a pink stuffed bunny trying to survive during a zombie apocalypse. The first time reading it I was a little disappointed because it was so fast and the ending was so abrupt (and I died), but I found the more times I read the book, the more I enjoyed it. As I went through the different scenarios, I learned more about this world (where humans and stuffed animals cohabit) and about the characters. This is absolutely the most hilarious book I've read all year! In a "Choose-your-own-journey" style, this book leads you (a pink stuffed bunny) through the hellish events of very rapidly occurring zombie apocalypse. There a tons of pop culture references, fourth wall shattering comments, and plenty of beautiful ways to DIE. The cover boasts of 112 endings, of which at least seven will see you through to other side of this nightmare! It was fun, silly, and zombietastic. What more could you want? Let's dive in here. Let's go deep, and really think about what makes a choose your own adventure zombie apocalypse story starring a sentient plush bunny rabbit tick. I'm going to get really technical and really detailed, and I think we'll all learn a little something before we're done. Using terminology I largely invented, Zombocalypse Now is a choose your own adventure book that specializes in persistent, binary-unfolding, latitudinal choice. In terms of those latter two adjectives, that means i Let's dive in here. Let's go deep, and really think about what makes a choose your own adventure zombie apocalypse story starring a sentient plush bunny rabbit tick. I'm going to get really technical and really detailed, and I think we'll all learn a little something before we're done. Using terminology I largely invented, Zombocalypse Now is a choose your own adventure book that specializes in persistent, binary-unfolding, latitudinal choice. In terms of those latter two adjectives, that means it's very close to the original style of choose your own adventure books, such as Edward Packard's Sugarcane Island, back in the 1970s. Generally speaking, that means that most entries that aren't endings contain a least two choices, and the choices keep branching off into largely separate paths until you do reach an ending--hence the binary-unfolding part. (The separate path part is what distinguishes these books from gamebooks like the Fighting Fantasy series, which tend to feature more crossover and merging between paths, as well as be directed towards a single "main" ending.) Later books in the original series tend towards fewer choices, with more entries that are just part of the story leading directly to another entry, without choice--as a result, if you "mapped" out all the choices of these books, the map would be longitudinal; the first few CYOA, and Zombocalypse Now are, in comparison, latitudinal, in that their choice maps are much more spread out along the horizontal. Where Zombocalypse differs from the original CYOA is in the writing, and it's here that Youngmark shines. In particular, the CYOA series was infamous for its choices being narratively inconsistent; if you made one choice, your best friend could turn out to be a soviet spy, and another choice, the same friend was an alien all along. Rather than the friend being both an alien and spy, the different paths posit mutually exclusive narrative universes. Brace yourself, because Zombocalypse does something entirely different. Rather than radical exclusivity, Zombocalypse exhibits radical persistence, where fundamental aspects of the plot remain the same regardless of what choices you make. For example, the cause of the zombie outbreak is the same throughout, and many of the characters you meet down one path will be there down another, pursuing the same sort of actions they'd be doing with or without your presence. The result is that the book feels much more like a simulated world, where the plot is unfolding with or without you, and you choose what course you take within it. Occasionally, the book even draws on that knowledge, letting the reader draw their own conclusions--one ending, for example, takes on a very different tone when you realize exactly what you're bringing into the refuge. I'd argue that Youngmark uses persistence to better effect in his next choosematic book, Thrusts of Justice, but it's definitely a selling point here as well. So that's structure, more or less. Let's talk about writing. The immediate question here is, why make the reader-character a sentient plush bunny? Why take the zombie apocalypse, and add the fact that in this world, sentient plushies exist? Arguably, the book wouldn't be intrinsically different without its rabbit lead, but it does serve a few purposes. Usually, CYOA make the reader-character as bland as possible, to encourage the readers to think of them as themselves; this identification usually runs afoul of the fact that the character is often implied as teenage, male, and, frequently, white. By making the reader-character something impossible, it jumps over that hurdle; it also creates some distance between reader and character, which helps with the fact that this bunny will be dying a lot. (It's a side effect of the binary-unfolding, latitudinal CYOA that they have a lot more endings than most CYOA; the zombie setting helps with that, because it's implied that your character is going to die a lot.) And it also sets a tone, that the book's going to be humorous and somewhat absurd, which again helps with the high fatality count. And in general, the book is absurd and funny; Youngmark puts a lot of detail and style into his writing, and it helps. When I started reading the book, I mistakenly thought there was only one good ending; I think I was confusing it with another zombie-based CYOA. That's not quite the case, but there are a large number of ways to die, and very few ways to eke out survival in this zombie world. What I like about the book is that, within the boundaries of its persistence, it explores a large number of permutations on the zombie theme--there's several variations of the survivors turning on each other, there's uncovering the conspiracy behind the zombies, there's a pet semetary tribute subplot, and there's even a dedicated bit where it really dives into what it means to be chainsaw wielder in a zombie world--a lot more complicated than you'd think. On the subject of the book's themes, it's worth noting that virtually all of the good endings come about through a team-up; more or less any attempt to go it alone in the zombie apocalypse winds up in death. I appreciate that; for virtually all the characters that you could feasibly form an affection for, there's a way to make sure they survive. My main complaint about the book, however, is that the result of the choices are often not predictable through what's offered. Consequently, it sometimes feels arbitrary what path will lead to victory and what one is another death. One could argue that this was done purposefully to reinforce the arbitrariness of fate in the face of apocalyptic event, that the true terror is not the zombies themselves, but the realization that the universe is ultimately capricious and uncaring. One could also argue that, nah, it's just easier to write it that way. This choose your own adventure is cleverly written and I admit that I laughed at a few of the scenarios. I usually got myself in trouble because I kept forgetting that I was a pink stuffed bunny! Having said that, I would not really call this a book; it is a novelty item. In this adventure you read a scenario based on a zombie apocalypse - and, yes, you are a pink stuffed bunny that walks and talks -and then select from two plot lines which drives events until you either happily survive or, most This choose your own adventure is cleverly written and I admit that I laughed at a few of the scenarios. I usually got myself in trouble because I kept forgetting that I was a pink stuffed bunny! Having said that, I would not really call this a book; it is a novelty item. In this adventure you read a scenario based on a zombie apocalypse - and, yes, you are a pink stuffed bunny that walks and talks -and then select from two plot lines which drives events until you either happily survive or, most probably, expire due to stupid decisions. I loved which way books when I was a kid and enjoy seeing them resurrected. This one was different and fun. You get to be a chain smoking stuffed bunny who is waiting on their date and end up in the zombie apocalypse. Can you fight your way through or is stuffed bunny on the menu? Haven't gotten all 112 endings yet but oh my God is this book hilarious. I didn't grow up with these types of books but I am glad they are still around. I always loved the concept of the choose your own adventure book as a kid but I rarely got my hands on one and if I did they were usually bad spy stories or something. Fortunately this is a zombie story. Zombies have to be about the best subject for a choose your own adventure book. I mean honestly, who hasn’t watched a zombie movie and thought, No, I’d do it this way or that way? Well with Matt Youngmark’s book you can do just that. Except this isn’t your run of the mill zombie story. You start I always loved the concept of the choose your own adventure book as a kid but I rarely got my hands on one and if I did they were usually bad spy stories or something. Fortunately this is a zombie story. Zombies have to be about the best subject for a choose your own adventure book. I mean honestly, who hasn’t watched a zombie movie and thought, No, I’d do it this way or that way? Well with Matt Youngmark’s book you can do just that. Except this isn’t your run of the mill zombie story. You start out on a date with some chick you met on the internet. Simple enough. Except you’re a rabbit. Not even a fuzzy little nose wiggling carrot eating rabbit. You’re a stuffed rabbit. Apparently stuffed animals live along side humans in this world for reasons that are never fully explained. There is a casual mention of a civil rights movement for stuffed animals, but as the main character you don’t find the topic particularly interesting. What you do find incredibly interesting is the fact that people are turning into mindless brain craving psychopathic living dead. Unfortunately for you stuffed animals do in fact possess some form of brain matter and this gray squishy stuff is incredibly tasty to the hordes taking over the city. So off you go, reacting to situations. It just occurred to me that it will be incredibly difficult to discuss the plot line in anything closely resembling a detailed description. Spoilers sweety. In fact, the choices begin after meeting your date so I’ve pretty much divulged all I can without completely ruining the whole thing. Luckily we can have a lovely discussion regarding the structure of the book itself, and if your interested I’d love to discuss the navigation system developed for the Kindle. You can’t exactly “turn to page 100 if you want to end it all and pull the pin on the grenade before the zombies engulf you.” That’s not a scenario I’ve run across for the record. The characters I’ve come across are all quite entertaining and if you follow them long enough they even develop sufficient depth, reaching beyond their initial defining characteristic. There was one particular character that I grew quite fond of and was sad to see him go. Still, he died well. Oops. Did I say too much? Better keep moving. Youngmark’s writing is both clever and well composed, which already puts him above every other choose your own adventure book I’ve ever read. As you can imagine, a book whose main character is a lonely stuffed rabbit trying to make it in this modern society is not a book that takes itself particularly seriously. This really gives Youngmark a lot of leeway to do some fun things. The genre, choose your own adventure that is, is notorious for breaking the fourth wall particularly upon reaching a conclusion to the story, which Youngmark does to a degree. But he also plays on the absurd and stretches the boundaries of accepted zombie cannon in fun ways that are all together acceptable and more importantly entertaining. The choices are about as diverse as you could ask for, but given the situation it’s not surprising that almost all of the 112 conclusions end in death. Either that or I made about 50 very poor choices. In fact, I died within five minutes of picking up the book. I will say there is at least one happy ending and one bittersweet. Luckily the great thing about choose your own adventure books is they have an exceptional amount of readability. I’m the sort of nut who will retrace my steps from my first ending and methodically play out each alternative with nothing less than German precision and with Zombocalypse this is an unusually rewarding experience. As I said, when your presented with this type of book in a digital form it can present some obvious issues when you try to back track. I don’t actually use my wife’s Kindle very often because I’m the sort of bibliophile who will not give up the tactile sense of holding a book in my hands and the Kindle has a surprising amount of buttons for a machine designed solely for reading books so it took me a bit to figure out how it worked. But once I figured out what the back button was for, this should have been obvious I know, moving through the various scenarios resulting in my grotesque departure from this life became a breeze. The only drawback is the need to scroll through each line to get to the hyperlink that will lead you to the next result. Unless I’m missing something there is no way to get the cursor to jump right to the link and sometimes I end up highlighting it instead of clicking on it. Still, it’s slightly faster than flipping through the pages manually. Keeping one finger on the last page always ruins the spine anyway. You are a living stuffed toy bunny. You are in a restaurant for a blind date, who turns out to be zombie. You start to realise that this might not be the best possible partner for you but what do you do? You are given two choices: Say you are going to the rest-room (toilets) to clean yourself up a bit and then make a run for it; or stick around a little while longer. If you chose the first option you "turn to page 4" but if you chose the second option you "turn to page 7". And so things progress in this way, with each scene providing two possible choices. Except for those scenes where you die, or survive, and there's a lot more of the former than of the later! For the author's first book this is a very fun little number. It reads well but is also simple to understand. While it is geared towards adults there's not really anything that would scare younger readers, but the content in general is geared towards adults - it being about zombies eating people and all that. I've "played" this three times already, all within the space of about 20 minutes. It does not take long to read and play this little adventure to its conclusion and two out of the three times I died, which is actually more fun than you'd expect. I also tested out going back a couple of steps to change my choice on one of the occasions where I died and managed to change the outcome into another survive. The brilliant thing about this book is the multiple formats available. You can buy the softcover version, or have it in epub/mobi format to use on your Kindle, or in Nook format for Nook devices or iBook editions for you iPad, iBook or iPhone! I have given this book an 8 out of 10 score as I think Thrusts of Justice is a better read but this is still a great little "time-filler" and is made better by the number of formats it is available in. Do you wish you could read a more grown-up version of the Choose Your Own Adventure books of your youth? If yes, point your browser to Amazon.com right now and search for Matt Youngmark's Chooseomatic books, buy them, read them, and choose your way to hilarity. If no, close your eyes and imagine a zombie ate your face and you died, because that's what happens when you choose wrong. It's OK, I'm sure you kept your place in my review and you can go back and make a better choice. I had the fortune Do you wish you could read a more grown-up version of the Choose Your Own Adventure books of your youth? If yes, point your browser to Amazon.com right now and search for Matt Youngmark's Chooseomatic books, buy them, read them, and choose your way to hilarity. If no, close your eyes and imagine a zombie ate your face and you died, because that's what happens when you choose wrong. It's OK, I'm sure you kept your place in my review and you can go back and make a better choice. I had the fortune of meeting Matt Youngmark at the Everett Oddmall, where I purchased all three of his currently available books, got them all signed, and had a jolly chat with him. I'm utterly thrilled with my purchase, not just because of the nostalgia factor, but because this book is funny, and I'm impressed with the number of creative ways I've died so far (I even got turned into a zombie and got to make a few choices in that capacity as well). Yes, the book is a tad corny (you are going through the zombie apocalypse as a fuzzy pink bunny after all), but they are also fun, unexpected, and utterly charming and delightful in their own zombie killing way. Yep, as I suspected when I wrote my notes however long ago it was that I wrote the two notes . . . The two best scenarios/paths were traveled first. Well, best in that one lead almost immediately to death, and the other lead to great things and repopulating the planet. All the other choices seemed to involve you dying. mmphs. There were some funny bits, but those were not as well taken when the only choices left are bad choices. And you know before hand that they will be. And they are. Ah well. Th Yep, as I suspected when I wrote my notes however long ago it was that I wrote the two notes . 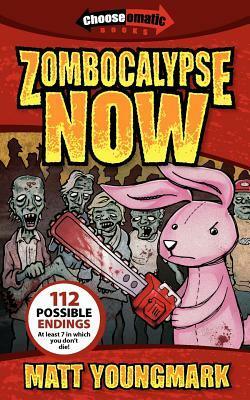 . .
A fun little Choose Your Own adventure book, detailing the attempts of a stuffed rabbit trying to save the world from a zombie epidemic. The book is light-hearted, and fairly amusing, although it wont last you too long. It's hard to know who the book is aimed at, as the subject matter is a bit too grim for younger readers, whilst older readers will not take too long to complete it. A choose-your-own-adventure style book, this was more enjoyable than I'd expected. Chock-a-block full of gruesome endings, with a few bright rays of hope, and no real way to logically guess which route will take you to a happy ending. Like all CYOA books, it suffers a bit from repetition, since you wind up re-reading the first few paths over and over again to fully explore the book. Funny and zippy, this would make a great subway read for shorter commutes. I checked out this book mainly because I enjoyed his second book, "Thrusts of Justice," very much. While it's parodying horror, a genre I'm not as familiar with as I am superheroes, I still found interesting and frequently hilarious insight into society, particularly what becomes important in an apocalypse. And the twist as to what created the zombies was nothing less than inspired. Zombie books are not my thing. But this one, this one is really funny. I'm still not going to get past the sample (I'd rather not end up with the nightmares I'm likely to get), but I'd definitely recommend that anyone who does like zombie lit give it at least a try. Mr. Youngmark's writing makes me smile. Thank you Matt. Took forever to actually get ALL of the possibilities and I probably didn't. Read it during a trip while my travelmate napped and had a lovely time informing her in all the gruesome details exactly how I died. Except when I lived ... twice ... how disturbing. I shall never look at stuffed animals the same way again. I loved choose your own adventures when I was younger. This is a fantastic new direction. The fact that the cover has "112 endings, a few of which you can survive in" was the kicker for me. I bought this, started reading it, and grabbed the other two the next day. I've found a few dozen endings already and survived one of them. I realize I'm biased, but ugh, bored. The basic functions of the story - plot, character - aren't there. Witty repartee? Not there. Gruesome and ironic deaths? Nope. Choices that logically affect outcomes? Nope, pretty random, left-or-right kinds of choices. I liked the cause of the outbreak, but one amusing reveal just wasn't enough. I never read choose-your-own-adventure books when I was a kid so I didn't have a frame of reference when I first picked up this book. I had a lot of fun going through and trying to find ways to survive the zombocalypse. I love that sometimes it talks back to you when you decide to change your course of action mid-way through a plot line. Awesome, zany, bloody, and with dark humor all over the place, this is a fun read. Your a stuffed bunny rabbit, and the end of the world has come in the form of (gasp!) zombies! A twisted and funny take on the old "Choose your own adventure" books! if there ever is a zombie apocalypse don't have me at your side. i made many a bad decision and died probably 7 times before i had success. i was so fed up with dying i kept my fingers on the pages of the last decision so i could go back to it easily. is this cheating? or just saving time? Really, really well done. I wasn't sure if this book would be much more than a gimmick when I picked it up, but the writing is sharp and funny. Brings me right back to my days of reading "Choose Your Own Adventure" books. This is awesome! I'm still trying to find ways to NOT die. The books says there are ways but I have yet to find them. Which means more fun for me! Overall, Matt Youngmark is no Max Brooks. But this is a good book to have around, either in your bathroom or next to your bong. THIS BOOK IS AMAZING!!! I loved it. Extremely well written and totally amusing. I love zombies, and trying to survive them in this book is so much fun. Plus you get to be a giant walking, talking pink bunny rabbit! Everyone should read this. I looked at this after buying #2 in the series. #2 was pretty good but this one looked too weird. Matt Youngmark is the author of the Chooseomatic Books series, the Arabella Grimsbro series, and the webcomic Conspiracy Friends (now collected in three paperback volumes). Back in the day, he worked the newsprint mines at Tacoma Reporter and Pandemonium Magazine.